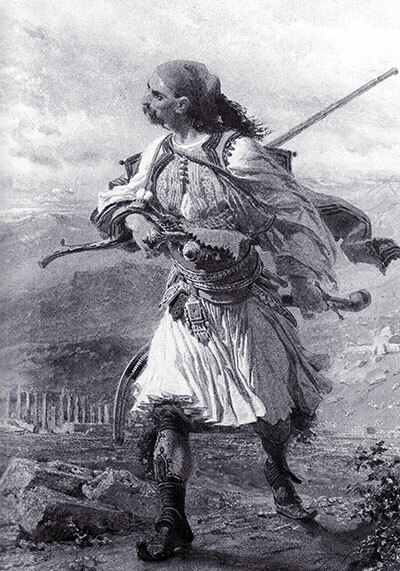 Albanian warrior, by Achille Devéria (lithograph, 1825). The Protestant pastor and preacher, Gottlieb August Wimmer (1791-1863) from Oberschützen in Burgenland, Austria, was early to be in contact with the British and Foreign Bible Society. He promoted education and travelled much in the Protestant cause, distributing Bibles in Hungary and in the Balkans. Wimmer published numerous editions of the Bible and preached in America in 1850. He died in Vienna, where a street, Wimmergasse, is named after him. Wimmer authored a series of German-language books on world geography and traditional lore, including a now rather obscure volume called “Neuestes Gemälde der europäischen Türkei und Griechenlands” (Latest Portrait of European Turkey and Greece), Vienna 1833. This book contains some interesting notes on Albania, a country which he does not, however, seem to have visited himself. Not all of his information is accurate. The Sanjak of Ohrid, situated between 40º 48’ and 41º 26’ N, and 37º 40’ and 39º 08’ E is the wildest part of European Turkey and makes up what is actually Upper Dardania and the Praevalitana region. It is the playground of knights-in-arms and their squires who make their living off the noble art of highway robbery and private warfare, ever-ready as they are in their stirrups. It would be the perfect theatre for the noble deeds of the Captain Robber Rinaldo Rinaldini. To the north and northwest lies Skutari [Shkodra], to the west is Valona [Vlora], and to the south and east is Monastir [Bitola]. Various small ethnic groups live in this region. Those of Mohammedan persuasion are devoted to the noble craft of armoury. They make use of their weapons on all the roads and mountain passes, in particular when there is no pasha in the vicinity to compete with. The Christian Greeks are forced to transform their homes into fortresses and to tend their fields with sword in hand. Ohrid, also called Achrida, is the capital of this sanjak. Those who are not skilled in knightly deeds are strongly advised to emigrate. Ohrid is situated on the lake of the same name, formerly called Lychnidus, and is halfway between Travnik and Joannina. This settlement was founded by the Serbs under Hospodar Samuel in the fourteenth century when the brave Scanderbeg was defending Albania. Amurath [Murad] conquered it and constructed the fortress on Mount Pieria, thus enabling the Turks to rule over the town that was inhabited by 7,000 Christians. The handicrafts known here are the same ones found in all the towns of this region. Lake Ohrid is encompassed by mountains that rise to some 3,000’ above sea level. The banks are exceptionally attractive and wildly romantic. The lake is four miles long and two and a half miles wide, and consists of crystal-clear fresh water. One can see right down to the sandy bottom. The many fish in the lake are a good source of income for the people of Ohrid because their tasty meat, fresh and salted, is much sought after in the markets of Albania and Rumelia. 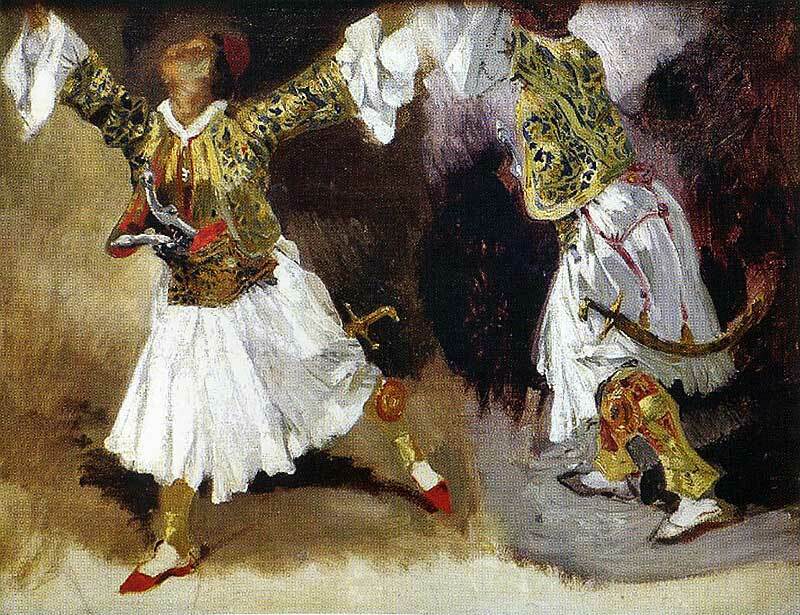 Study in Suliot costumes, by Eugène Delacroix (Musée du Louvre, Paris). We continue on from the Arnauts to Stronga [Struga] that is also on Lake Ohrid, at the southern end. Each year, in February, they hold a two-week fair here. The roads at this time of year are just as unsafe as they were at fair time on the way between Augsburg and Nuremberg. Merchants therefore get together in caravans and hire Arnauts to accompany them. The people of Struga are Albanian and there are 10,000 of them in the town and in about fifty surrounding villages. We now leave Lake Ohrid to explore the valley of Dibra to the north. This valley is irrigated by the Drin River that flows out of the lake here and continues in a northwesterly direction. The valley is thus well-off and fertile down to the land of Iballja in the eastern part of the Shkodra region. It is divided into Upper Dibra and Lower Dibra, the latter also known as Dibre Sigre and containing a town of the same name, four miles north of Struga, at the northern end of the valley of Modrika. 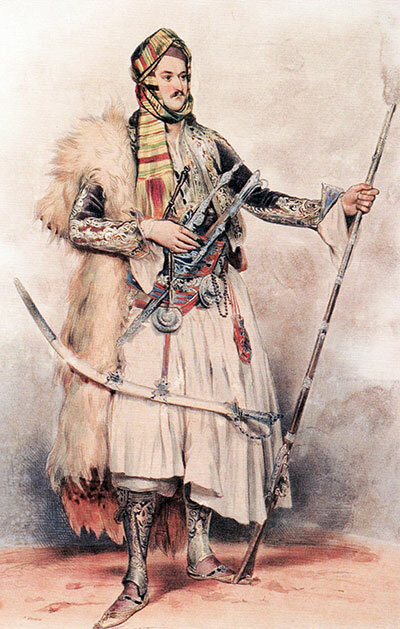 The said town is inhabited by 2,000 Mohammedan Albanians, armed merchants. There are also 24,000 people in the seventeen villages around the source of the Drin. Among them are 10,000 armed men. Lower Dibra or Dibre-Post [Dibra e Poshtme] is the northern part of the valley of Dibra. The town has 4,000 inhabitants and there are 12,000 Catholics in the forty-three surrounding villages. The whole valley of Dibra is covered in fair vineyards that are suitable for all sorts of wine. More profit, however, is to be derived from the excellent horse-breeding and the fine cattle than from agriculture. The people of this chilly but beautiful high plateau are known as armed shepherds because over half of them are also soldiers. They serve the Porte for a living or do battle on their own account, or they pillage the caravans that cross their territory. They are reticent to recognize the authority of the sultan and only do so in the presence of an armed pasha. The latter is, however, unable to exercise his power because, if he tries to do so, even the women take to arms to ensure the independence of their region. If one crosses the pass that leads westwards from Lake Ohrid, one enters a region called the Large Canyon [Megali Gryka] which is irrigated by the Devoll River, called the Scombus in ancient times. On the Devoll River, we come across Mokra [Molecha] with forty villages and a population of about 6,000 people scattered right to the Xhyra [Dschurad] mountain range. Mali is the main settlement of a southern and very mountainous region with fourteen villages called the Small Canyon [Mikri Gryka]. It has a population of about 4,000. Formerly situated in this region, about one mile northeast of Mali, was Voskopoja [Voskopolis], a very important town in the eleventh century that was founded by Romano-Slavic or Vlach shepherds. It was established on the ruins of the ancient town of Moshes, and there are now ruins upon ruins. We know nothing of Moshes, but we do know that Voskopoja evolved in less than one hundred years from a few Vlach huts to an important trading town of 40,000 inhabitants. Fire and sword from the Turks, however, transformed this Christian trading town into ruins again such that it is now what it once was – a collection of wretched huts among ruins and ashes. The district of the Small Canyon has excellent herds, and the horses, that are well adapted to climbing the cliffs, are used to equip the Albanian light cavalry. On the Devoll River, we find the little town of Shpat [Isbad] in the district of Bend where the Gura mountain range is situated. There are thirty-six villages strung out here, inhabited by Mirditans. The principal occupation is animal husbandry as it was three thousand years ago. This land is particularly suitable for all agricultural produce, and many of the mountain slopes are perfect for wine and fruit. In the valleys, they grow maize and wheat, as well as barley for the horses. The valleys that are protected and warmed by the sun are suitable for growing cotton, olives, citrus fruit and silk. The mountains and high valleys offer beautiful meadows where domestic animals thrive and where the bees find rich food for their hives dripping with sweetness. It is a land of milk and honey. Despite its southern location, the climate is not too hot. […] The people are thus well off. They have enough to eat and drink and good air to breathe, and are thus courageous, happy, industrious, lively and active. Such indeed are the Albanians.